On 25 March Naspers [NPN] announced its plans to form a new company comprising of its global internet assets. The company, temporarily christened NewCo, will be listed on Euronext Amsterdam and is poised to be Europe’s largest listed global consumer internet company. The new listing will include - amongst others - Naspers’ investments in Tencent, mail.ru, OLX, and Swiggy. Let’s unpack it. Currently, Naspers is undervalued compared to its underlying investments. For example, its 31% stake in Tencent is worth just shy of R2 trillion while Naspers is worth R1.57 trillion - according to the market. Compared to a sum-of-the-parts valuation, Naspers is trading at a 40% discount. Shareholders have long pressed management to address the discount - a phenomenon endemic to holding companies. 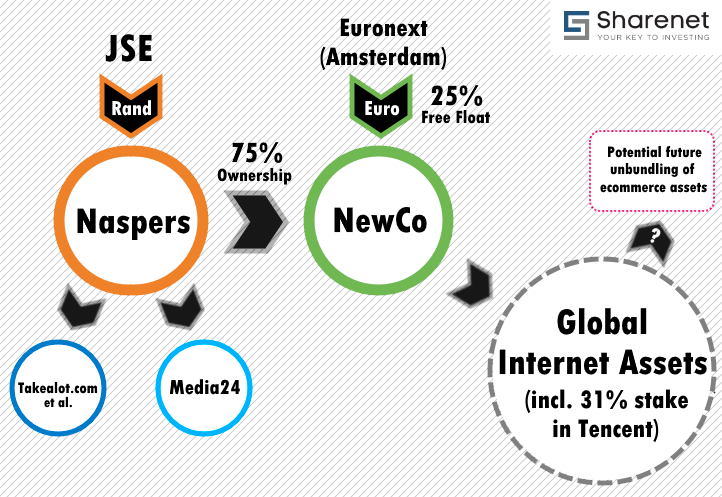 Naspers will retain 75% ownership in NewCo while 25% is made available for free float on the Euronext. Local assets still owned by Naspers include Media24 and Takelot.com. Thus, when investors are buying a Naspers share on the JSE, they will through Naspers hold a stake in NewCo as well as local assets. NewCo’s listing in Amsterdam opens the door for many global investors and fund managers to invest. Previously, many foreign fund managers may have been unable to buy Naspers shares due to mandates requiring that they exclusively invest in developed markets. Funds investing in emerging markets can still invest in Naspers on the JSE. It seems to be a best of both worlds’ scenario with Naspers/NewCo being made available to both spheres of fund managers. 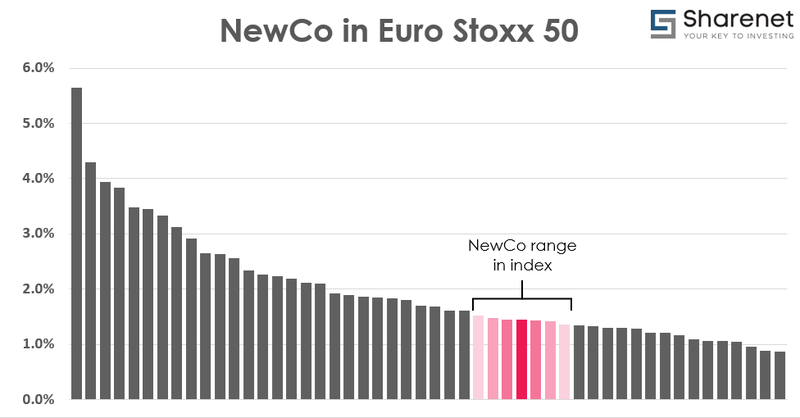 It is estimated that NewCo’s weighting in the Euro Stoxx 50 index will be between 1.2% - 1.8%. The new listing alone may not be enough to remedy the excessive discount. With the current plan, Tencent and the ecommerce businesses will fall under the same umbrella at NewCo. However, the road will be paved for future unbundling of entities such as Swiggy or OLX from NewCo. Owing to the recent successful Mutlichoice unbundling, a similar move may be on the cards in the future. 5. How will the value be unlocked? - Naspers has spent a grand sum investing in global assets which is currently not reflected in its share price on the JSE. NewCo’s listing of separate assets compels the market to value them through its share price viz. reducing the discount in Naspers shares. 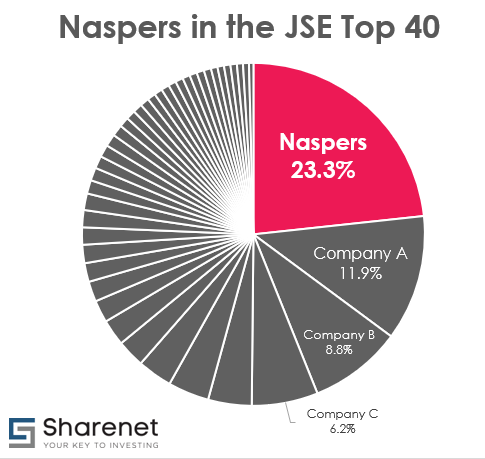 - A core issue is that Naspers is too big for the South African market with a 23% weighting on the JSE Top 40. Given that fund managers are averse to holding such a big weighting for one stock in their portfolios, Naspers tends to be held closer to the 15% weighting in equity portfolios. A large sum of capital is consequently allocated elsewhere. The intention is that the listing will decrease Naspers’ weighting on the JSE (thus allowing funds to have a holding representative of the index). - There are 3 to 4 times more assets under management in developed markets compared to emerging markets implying that a huge pool of investors now have access to investing in the NewCo group. This may arguably be the most notable impact in progressing to a fairer valuation of Naspers and its assets. Overall, the move has a multi-faceted approach to unlocking value and signals clear intention by management. The overwhelming reaction to Naspers’ plan has been positive and investors are satisfied that Naspers has finally put a plan on the table to bring the share price more in line with its fair value.